Classic caprese salad tossed with nectarines, peaches, cherries, and apricots. This stone fruit caprese salad is so delicious and refreshing and filled with summer vibes. Who is excited for stone fruit season? I know I am! As soon as it’s almost summer, I’m hitting the farmer’s market looking for my favorite peaches and nectarines. Of course, there’s the cherries and the apricots and apriums too. So many different fruits to choose from and to eat my way through. The farmer’s market is the best place to shop for all of your summer fruits because there’s so varieties for you to choose from. It’s not just yellow peaches or white peaches, yellow nectarines or white nectarines. There are a variety of types with different levels of sweetness. So if you like a little more tartness, you can choose that. Or if you like your stone fruits on the sweeter side, you can pick that. And the best part is that you can try all of it so you know what you’re buying. Since stone fruits are in season for just a couple months, why not add them into a classic summer salad? 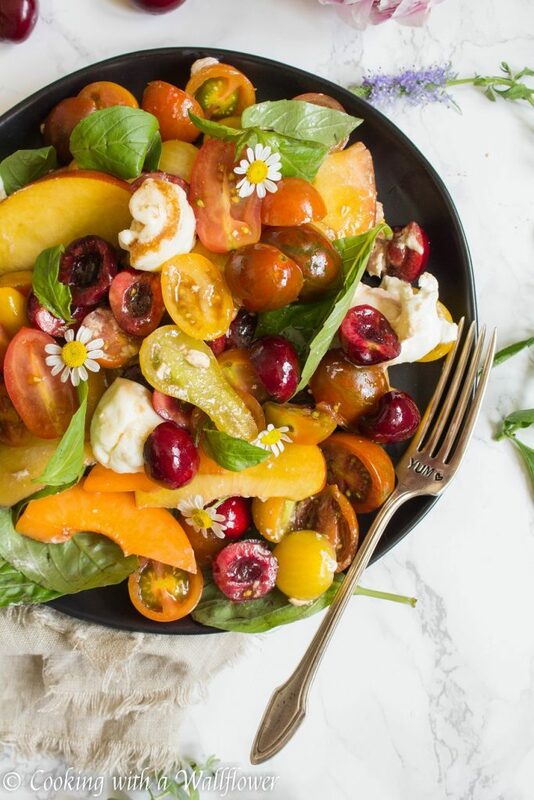 This stone fruit caprese salad has all of summer embodied in it. Sweet ripe tomatoes, fresh basil, stone fruit of all sorts, fresh mozzarella or burrata, and a drizzle of honey balsamic vinaigrette. So simple yet so delicious. I can eat this salad for days. Whisk together balsamic vinegar, honey, and olive oil until combined. 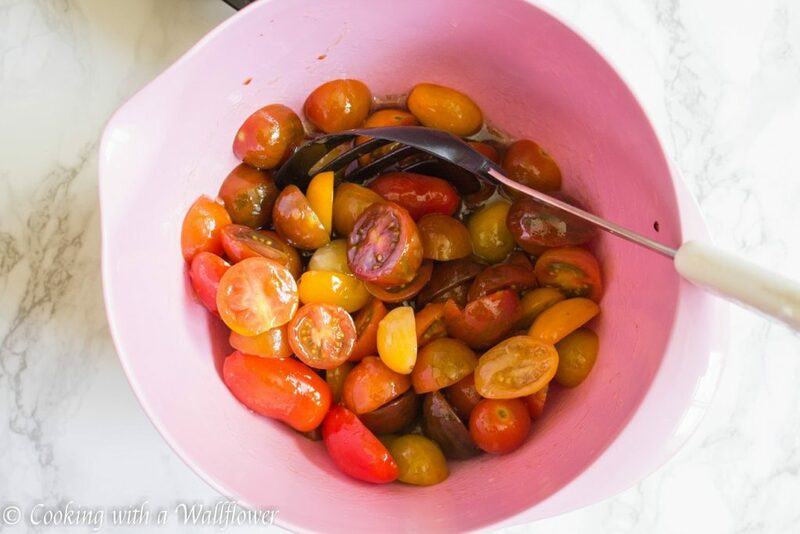 Add sliced grape tomatoes and mix until the tomatoes are covered in the vinaigrette. Let the tomatoes sit for about 10-15 minutes to marinate. 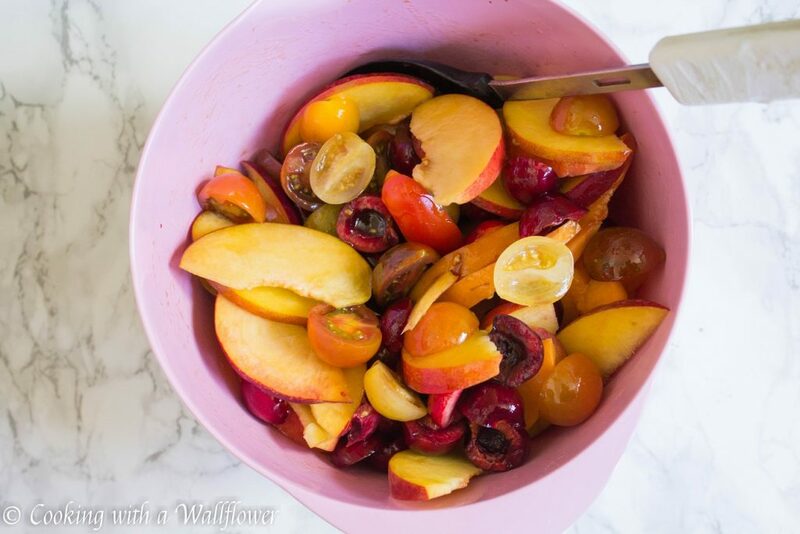 Add cherries, sliced apricots, sliced nectarines, and sliced peaches. Toss until combined. Add torn up pieces of mozzarella or burrata. And lastly, add basil leaves. By the way, just maybe invest in a cherry pitter because slicing the cherries and removing the pits were kind of a pain. lol. And I prefer to use mozzarella rather than burrata for this salad because the cream inside of the burrata doesn’t get everywhere. Serve this stone fruit caprese salad cold. Add cherries, sliced apricots, sliced nectarines, and sliced peaches. Toss until combined. Add torn up pieces of mozzarella or burrata. And lastly, add basil leaves. 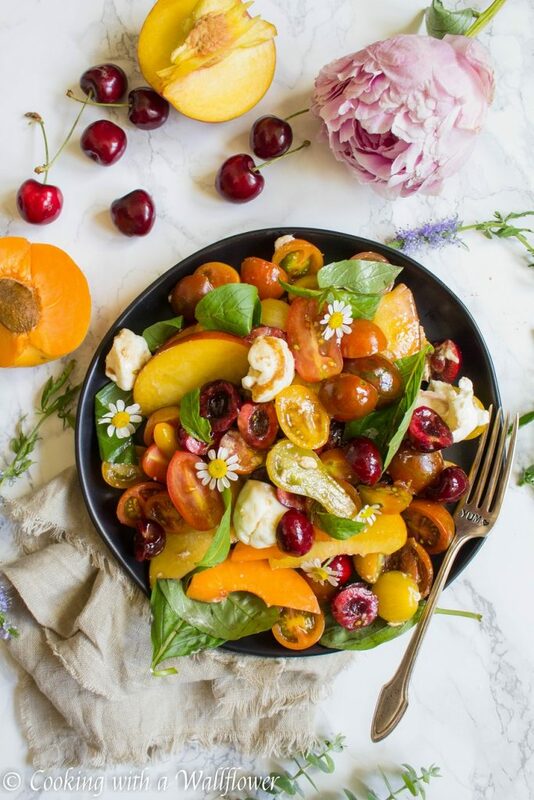 This entry was posted in Farmer's Market, Gluten Free, Quick and Easy, Recipes, Salad, Summer Cravings, Vegetarian and tagged caprese salad, farmer's market, gluten free, quick and easy, salad, stone fruit, vegetarian. I am a purist, so I have to object to the use of the name Capresi Salad for this dish. A Capresi Salad is Tomatoes, Mozzarella and Basil. 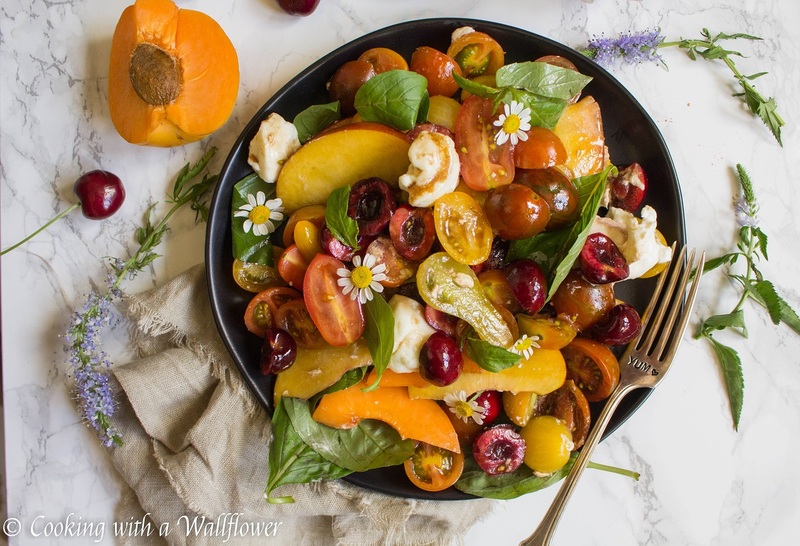 I’m all for upgrading, putting on your own flair, changing presentation, etc., but I feel like this one has too many modifications with the addition of cherries, apricots, nectarines and peaches this is no longer a Capresi Salad. 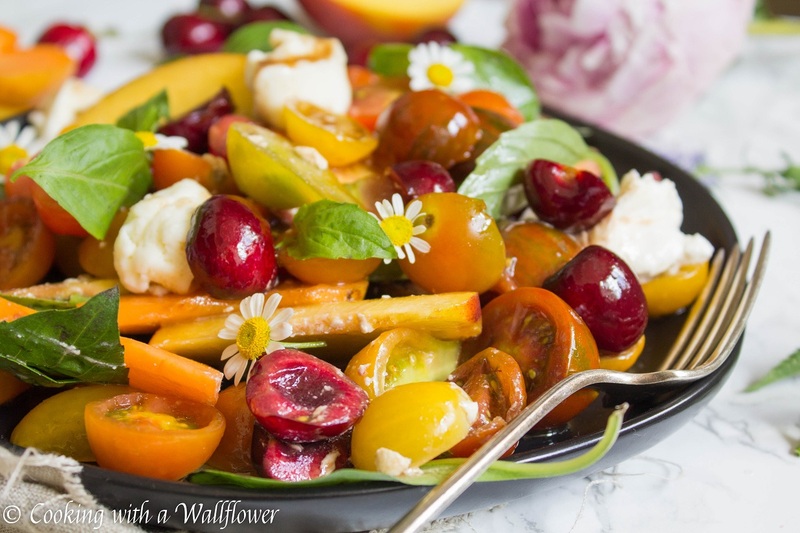 That being said, it looks like a wonderful summer fruit, tomato and mozzarella salad. What a beautiful salad! I never thought of adding honey to the vinaigrette. I’m going to the farmers market very soon! 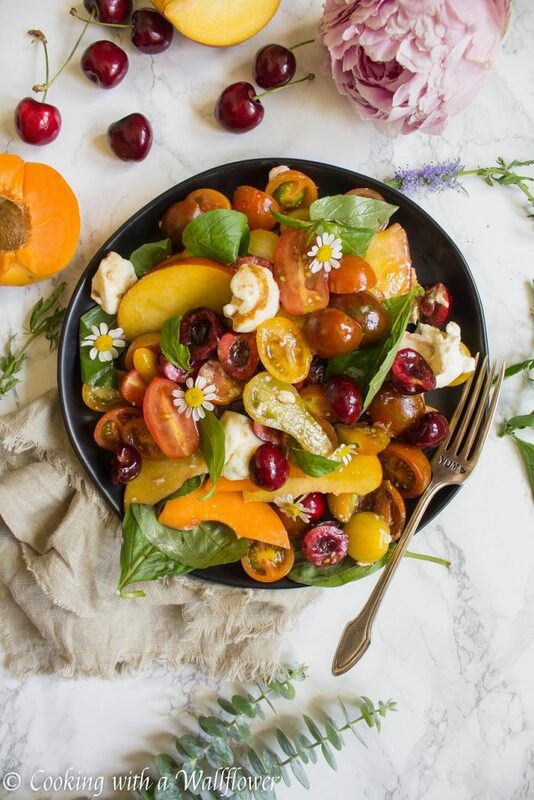 Love your idea of the tomatoes and stone fruits together with that yummy vinaigrette. Can’t wait to try this recipe. Thank you! after a week in CA I’m ready to bring all that color into my kitchen!! Love the rainbow colors! Looks so delicious. Definitely Going to make it ! Love the look of that salad – so vibrant!